Our marine customers are faced with a vexing problem – how to improve emissions to meet international standards without compromising engine performance. Volvo Penta not only has a solution, but one that can improve your engine’s functionality. Volvo Penta’s Selective Catalytic Reduction (SCR) aftertreatment reduces NOx in the engine emissions by introducing diesel exhaust fluid that causes a chemical reaction in the catalysts to form healthy molecules of nitrogen, oxygen and water. All of this is done while maintaining acceptable back pressure, engine efficiency and performance. “SCR lets us help our customers meet the new emission standards while also maintaining the durability and longevity of their vessels,” said Rich Murdy, of our marine division. The International Maritime Organization, which promotes marine safety, sets environmental standards for the shipping industry. The latest benchmark, IMO III, reduces the allowable amount of nitrogen oxide, which is linked to acid rain and smog, in emission control areas up to 75 percent. Volvo Penta’s system captures the engine’s exhaust and mixes it with diesel exhaust fluid containing urea in the SCR. The chemical reactions in the catalyst transforms the nitrogen oxide in the diesel exhaust with the urea into a harmless mix of nitrogen, oxygen and water. Volvo Penta’s SCR reduces nitrogen oxide in emissions up to 75 percent compared to the previous IMO II standard. If you combine the SCR with Volvo Penta’s IPS system, fuel consumption and CO2 emissions can be reduced up to 30 percent while increasing the cruising range up to 40 percent. Most of our customers utilizing the SCR will be doing so for new builds and repowers to operate internationally between the United States and Canada. Volvo Penta knew this would be the case and designed the SCR so it’s compact and allows for great flexiblity in design and installation. The SCR can be mounted in different positions. It can be installed upside down, on the floor or above the engine. The urea dosage valve is the only component requiring a specific orientation. The SCR features an airless injector that eliminates the need for a separate compressed air system. This makes installation easy and reduces additional maintenance parts. The SCR uses an intelligent quality, level, and temperature sensor in the urea tank that controls the level and quality of urea, allowing the customer to use 32 percent or 40 percent urea. They can also have the main tank outside the engine area to pump to the day tank near the engine. The SCR reduces engine noise by at least 35 dBA, allowing some applications to not need an additional muffler with the small space constraints. Our Volvo Penta engineers utilize decades of experience with on highway and off-highway markets to bring emission solution that best fits the needs of our marine customers. By working in a variety of markets, we’re able to use our knowledge to supply a robust and efficient emission solution to minimize any downtime of your ship. 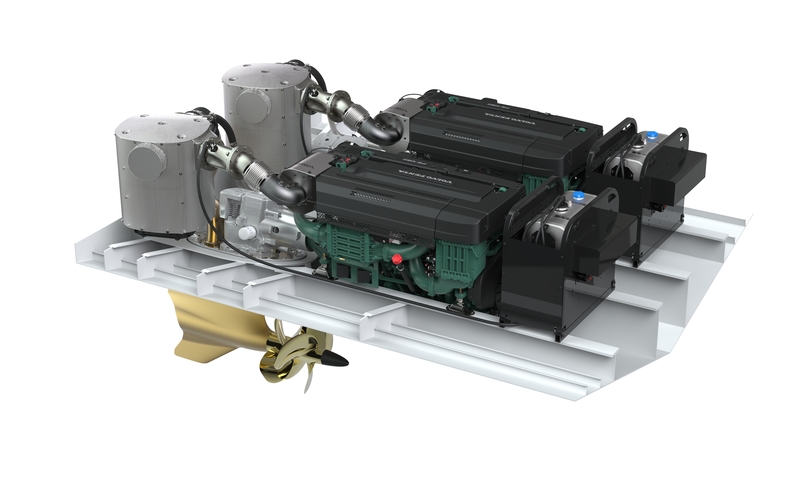 “Between Volvo Penta’s smart design of its SCR system and our abilities to maximize its benefits, we’ve got the perfect solution to help our customers meet the new emission standards,” Murdy said.